This is the combined household of Sir Ix, Sir Vargas and Master Chen. It consists of all the members of each of their Houses plus others. The name Terrae Finis means the Ends of the Earth and refers to the fact the original two heads of the household were from China and Mexico. Sir Vargas continues the tradition of being non European as a Moor. The household is dedicated as a fighting house in service to the Middle Kingdom via the Midlands army. If you are interested in joining the household you should contact Vargas or Ix directly. As everyone on this list and in this household should know, 2009 had major changes at the heads of household level. This has caused the chivalry of the household to get together and discuss the future of the household. With Master Chen having sold his home and thus no longer having any residence in the Middle, he is obviously a subject of the Crown of Artemisia. That means that his fealty must be there. Thus any extension of fealty from his squires no longer leads to the Middle Crown. The stated purpose of House Terrae Finis has always been to serve the Crown of the Middle by being a fighting force of the Midlands army. This was even the purpose of House Jaguar before Terrae Finis. And Chen, Vargas and I have determined that we should put it back on that track. The first major change is the introduction of the Terrae Finis Foreign Legion. This will be a special branch of the household only for those who live outside of the Middle Kingdom and thus have their first fealty to another Crown. The premier of the Foreign Legion will be Master Chen. The second change is a logical one from the above. Since Chen is no longer in the Midrealm and may choose to add squires, men at arms, etc to his house, the automatic members of House Terrae Finis shall now be Ix and his dependents in House Jaguar and Vargas and his dependents in Casa de Leon. The third change is that we are changing the membership of House Terrae Finis to be only what its charter says. Fighters and support personnel for the Midlands Army to serve the Crown of the Middle. We are asking everyone not directly in House Jaguar or Casa de Leon to contact Vargas and I and let us know that you want to still serve in one of those capacities. Fighters include armored, unarmored, or equestrian combatants. Support personnel are those that do such things for the household as produce favors, tabards, armor, or the like for the unit; those that do such things as water bearing or assist in the transportation of fighters, weapons, armor etc to wars or the battlefield; those that stay and help keep track of the fighters in battles at war; and those that provide for the household in other ways that I might not be able to list here. The big thing with this one is that we want to hear that you want to do this. These will be the active members of House Terrae Finis going forward. Those that do it in their home kingdoms will be in the Foreign Legion. We are working on titles for the people in this category since they will not be standard men at arms. For now we will just use member. The final major change is related to all of the above. As we just brought Theornderyc into the household as warrior but not in either House Jaguar or Casa de Leon, we look to bring others into House Terrae Finis in this manner. 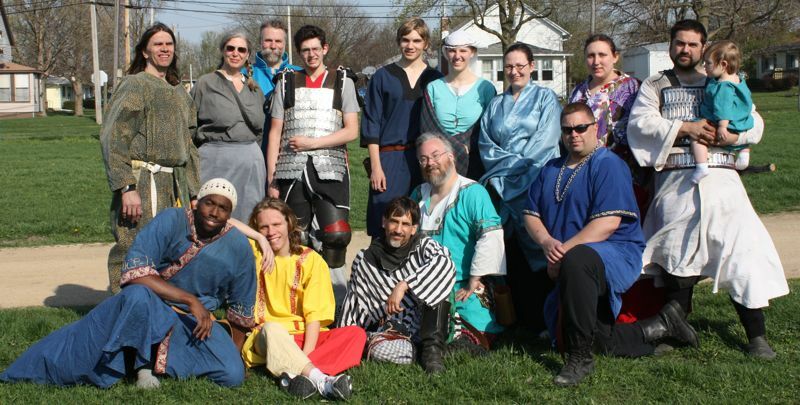 We are looking for active SCA people who hope to travel to a war per year. People that are willing to fight with Terrae Finis war bands for the Middle. People willing to raise our banner while we fight under it. People wanting to support the troops of the Dragon. People willing to pick up a sword and follow Sir Vargas and I into battle, be that sword made of rattan or blunted steel. We have had several people ask us about this. We now have a place for them. Finally, this means that those people who just want to be friends of Terrae Finis, will now be just that. We love our friends and we have many of them. We will party with all of you and fight with all of you as we always have. But we understand that some of you might not want to make this dedication. If you do not wish to do so, there is nothing lost between any of us by that choice. Please also note that we are only looking for active household members at this time of rededication to the household. If members do not respond that they wish to continue in service, then they will be dropped and can always ask to return later, when their activity level increases. This was announced at Rites of Spring. We shall have another household meeting for anyone wishing to discuss this at Awakenings. We will also be taking another updated household picture there. This list is only for household members and is moderated by Ix and Elayne.